Utamaro Kitagawa is internationally famous because of his stunning art and this notably applies to the art of beautiful women (bijin-ga). Despite this, the life of Utamaro is shrouded in mystery because many areas remain foggy. Therefore, it is the art of Utamaro that breaks down barriers based on amazing art pieces that stood out in the Edo period, just like they still stand out today in the modern world. 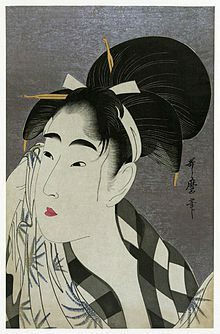 Torii Kiyonaga and Harunobu Suzuki influenced Utamaro in the early period of his art. It is also widely believed that Utamaro studied under Toriyama Sekien. At the same time, the publisher Tsutaya Juzaburo was instrumental during the earlier development of this esteemed artist. Therefore, Utamaro initially developed from the shadows and guidance of others before focusing on his own dynamism. Internationally, the acclaimed ukiyo-e art of Utamaro reached the shores of Europe in the middle of the nineteenth century. Of course, by this time Utamaro was long dead. Likewise, by 1868 the world of the Edo period had been totally eclipsed by the modernist Meiji era. 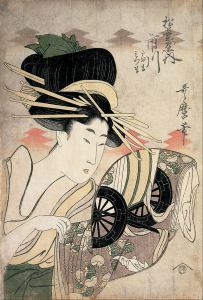 However, while the sun of ukiyo-e was growing weaker in this period of Japanese history – despite amazing Meiji ukiyo-e artists – ironically Utamaro was reaching a new world long after he had departed from this world. 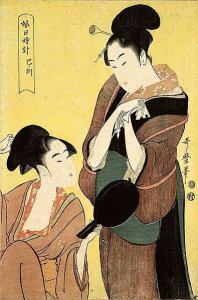 This new period applies to Impressionism because many famous European artists in this art movement were influenced by the traditions of Japanese ukiyo-e. Not surprisingly, Utamaro was one of the most notorious Japanese artists – along with Hiroshige and Hokusai – who reached the Impressionist artists of Paris and other major European cities. The richness of Utamaro in the area of partial views, bijin-ga and light and shade certainly hit a nail for many Impressionist artists. Similarly, during his own lifetime his half-length portraits would inspire Japanese artists, just like they inspired future generations internally and internationally. Also, by 1791 his main focus was now single portraits of beautiful ladies rather than females in groups. Overall, much remains unknown about Utamaro, for example the year he was born and his family background to any major extent. Similarly, it is difficult to understand the real Utamaro in terms of his internal thinking. Despite this, the richness of his art – and his notoriety within the Impressionism movement – means that Utamaro leaves behind a rich and varied legacy both within Japan and internationally.